So, Who Sells The Most Games in Japan & Europe? Let's find out! As part of its annual report, published today, Capcom included a handy little chart that shows (as of the end of the last financial year) the breakdown of market share between software publishers in the Japanese and European markets. North American figures weren't included at the request of the NPD Group. The results may surprise you! 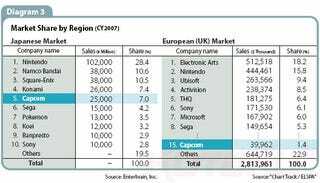 While Nintendo's dominance in Japan is to be expected, Capcom's lowly 15th place finish in Europe is not. Nor is Sony managing to muster only a 2.8% share of its home market, nor is EA beating out Nintendo to the top spot in Europe. Just goes to show Wii Play and Brain Training can only do so much against the unstoppable force that is FIFA.